SUNSHINE, our greatest source of potential power, is now largely wasted. It is highly probable, however, that a few years hence science will find a way to harness the mighty energy of the sun’s radiation. Solar engines and solar heating apparatus will then make it economically practicable for us to use at least a small portion of our now-wasted sunshine to run our factories, light our streets, cook our food, and warm our houses. In the United States we use, each year, something like a half billion tons of coal, a half billion barrels of oil, and fifty billion horsepower hours of water power for heat, light, and power. If it were possible to convert all this energy into powerâ€”which of course it isn’tâ€”it would produce seven trillion horsepower hours. If it were possible to convert completely into power all the solar energy that each year falls on the United States in the form of sunshine, it would amount to seven thousand trillion horsepower hours. Of course, some of the sunshine that comes to us through 93,000,000 miles of space is needed for the general heating of the earth and for the growing of plant life: but above those fundamental needs, solar radiation provides a potential supply of power many thousand times as great as the amount now supplied by other sources. Solar radiation experts estimate that the sun emits 12,500 horsepower of energy for every square foot of the 585 billion square miles of surface it exposes to the earth. By far the greater part of this almost unthinkable amount of power is lost on its long journey through space, but the radiant energy that reaches the outer surface of the earth’s atmosphere is equivalent to 7,300 horsepower per acre, and at noon on a clear day 5.000 horsepower per acre is transmitted through our atmosphere to the land surface of the earth. The theoretical power value of the sunshine that falls on the 133 square miles of the city of Philadelphia is equal to the power that could be generated by a hundred Niagaras. The Sahara Desert, in a single day, receives solar energy equal to the power that would be produced by burning 6.000 million tons of coal. No one thinks that it ever will be possible to convert into mechanical power anything like all of the theoretical power value of the heat reaching the earth from the sun. Steam boilers and steam engines have been built for a good many years now, but no boiler or engine has been built that can convert all the heat of coal into its theoretical equivalent of actual power. The heat value of good coal equals 12,760 horsepower hours a ton, but the best result ever obtained from a ton of coal with a boiler and steam engine is 1,470 brake horsepower hours, 11.5 per cent of the fuel’s heat value. That the use of solar radiation for power is no vague dream of the far-distant future is shown by the fact that at present a solar power plant with a thermal efficiency of 4.32 per cent â€”over one third of the efficiency of the best steam engineâ€”has been built and is being operated. Over 2,000 years ago, a few wise men knew enough about solar radiation to concentrate the sun’s rays for their own benefit. Among them were the pagan priests of ancient Rome, who occasionally allowed the sacred fire in the temple of Vesta, the Goddess of the Hearth, to go out, and then rekindled it by placing a piece of carefully dried wood in the focus of a conical metal reflector and letting the sun do the rest. Also there is a classical story that the famed philosopher Archimedes, when a Roman fleet was attacking Syracuse in 214 B.C., set fire to the Roman warships by concentrating sun rays on them by means of mirrors erected on the shore. It was in an effort to prove the possibility of this tale that, in 1747, Buffon, a French naturalist, made the earliest known scientific experiments leading toward the utilization of solar energy. He mounted over 300 small glass mirrors on a frame so that each of them could be adjusted separately, and so that all of them could be made to concentrate their rays at any desired distance. With this apparatus he set fire to wood over 200 feet away, and melted silver at a tenth of that distance. A few years later Hoesen, a mechanician of Dresden, built a mirror ten feet in diameter whose concentrated rays almost instantly melted coins. To-day, almost two centuries later, scientists still are interested in burning glasses. Dr. George E. Hale, astronomer at the Mount Wilson Observatory in California, recently designed a fifteen-foot instrument with thirty lenses that generates a temperature of 6,000 degrees centigrade that melts steel wire as fast as an ordinary gas burner would melt butter. About twenty years after Buffon’s experiments, H. B. de Saussure, a Swiss scientist, invented the solar hot box. Realizing that it is not until the sun’s radiant energy strikes some material object that it is converted into heat, and that black, which absorbs all of the sun’s rays, is the most efficient color for this conversion, he constructed a small wooden box, painted it black inside, and covered it with two sheets of plain glass with an air space between them. Just how high the temperatures were that he obtained in this box when he set it in the sun is not known, but when, in 1837, Sir John Herschel used a similar box in Cape Town, a thermometer in it registered 240 degrees Fahrenheit. Sir John astonished his neighbors by using his apparatus for the homely purpose of frying eggs and stewing meats and vegetables. So it seems that his crude hot box was a sort of rough draft of the solar cooker that in recent years Dr. Abbot has developed to a high degree of efficiency. De Saussure and Herschel had been content to prove that it was possible to collect the sun’s heat. In 1874, August Mouchot, a brilliant French engineer and the greatest of the pioneer harnessers of the sun, took a long and bold stride forward. He used concentrated reflected sun rays to generate steam in a boiler, and used that steam to operate a small engine. Mouchot’s apparatus, the first solar power plant, consisted of two principal partsâ€”a reflector and a boiler. The reflector, a truncated copper cone lined with thin silver leaf, looked like a big lamp shade pointed skyward. It was thirty-two inches deep, had a diameter of forty inches at its base, and a diameter of 102 inches at its mouth. A hand-operated mechanism made it possible to shift the reflector to follow the movement of the sun. Attached to the lower base of the reflector, its axis the same as the reflector’s, was the boiler, a blackened cylinder made of copper about one-tenth inch thick, eleven inches in diameter, and thirty-two inches long, enclosed by a glass cylinder four inches greater in diameter. The space between the boiler and its enclosing glass cylinder was filled by a two-inch layer of hot air. Inside the boiler was another copper cylinder, somewhat smaller in diameter, only twenty inches long, and hollow except for feed and steam pipes. About twenty-one quarts of water could be heated between the two copper cylinders, and the steam chamber had a capacity of about ten quarts. On a bright day, the sun’s rays concentrated on the boiler by the reflector produced a steam pressure of thirty pounds per square inch in forty minutes. The pressure then was raised rapidly to seventy-five pounds per square inch, the safety limit of the lightly-constructed boiler. On a very warm day the boiler vaporized over five quarts of water an hour, and the small engine it ran, driving a pump, developed one-half horsepower. WITH the financial assistance of the French government, Mouchot continued his solar-power experiments for twenty years. One of his later plants had a boiler made of several tubes placed side by side, which, when tested over the span of a year by independent engineers, showed the excellent boiler efficiency of forty-nine per cent. Some of his plants were used successfully for pumping water in Algeria. In America, John Ericsson, the Swedish-born engineer and inventor who had done his adopted country so valuable a service by designing the Monitor that sank the Confederate ironclad Merrimac, was working industriously on the problem of obtaining cheap power from the sun. In 1883 he built in New York a solar power plant, his eighth, that was comparatively inexpensive and highly efficient. The reflecting apparatus consisted of a rectangular trough eleven feet long and sixteen feet broad, built of straight wood staves supported by curved iron ribs. To these staves were attached mirrors made of common window glass silvered on the underside. The trough, revolving around a pivot so that it could be made to follow the movement of the sun, was supported by light steel trusses, to which was attached a water heater six and one-fourth inches in diameter and eleven feet long. The sun’s rays concentrated on the heater by the reflector produced sufficient steam to operate an engine with a six-inch working cylinder and an eight-inch stroke. Ericsson was eighty years old when he built this machine. Had he been younger it is probable that he would have developed it to very high efficiency. Other inventors continued working on the problem. In 1904, residents of Pasadena, Calif., were astounded by the erection of the largest and most powerful mirror-type solar generator that ever has been built. The brain child of Aubrey G. Eneas, an Englishman living in Boston, it had a cone-shaped reflector thirty-six feet in diameter that weighed over four tons, moved by a clock-controlled motor so as always to be in accurate focus w;ith the sun. The mirrors of the reflector were of white glass, one-sixteenth of an inch thick, sprung to the curvature of the frame. THE boiler, formed of two concentric steel tubes enclosed in two glass tubes with an air space between them, was thirteen feet six inches long, and was placed at the axis of the reflector. The water was circulated up between the steel tubes, and down the inner tube. About thirteen and one-half square feet of sunshine was concentrated on each square foot of the outer surface of the boiler. The machine transformed about four per cent of the solar radiation intercepted by the mirror into mechanical work, and gave an all-day average of about two and one-half horsepower. Eneas built several similar plants, which were used for pumping water, in southern California and in Arizona. THE late Frank Shuman, of Philadelphia, came the closest of any of the sun har-nessers to making solar generation of power a commercial success. Starting work in 1906 on the hot box principle, he built several successful experimental plants. In 1911 English capitalists became interested, and the following year he was invited to build a large sun-power plant in Egypt. Professor C. V. Boys, the English physicist who invented the quartz fibers now largely used in instruments of precision, and A. S. E. Ackermann, an English consulting engineer, became associated with Schuman in the work. At the suggestion of Professor Boys the design of the absorbers was changed from the old hot box to a reflector-lined trough something like the one that was used by Ericsson. The boilers were placed on edge at the focus of the reflectors, so that both sides would receive the reflected rays, and were covered by a single layer of glass enclosing an air space around the boiler. Each channel-shaped reflector and its boiler was 205 feet long. The five reflectors were automatically heeled so as to follow the sun all day. A total area of 13,269 square feet of sunshine was caught, and the maximum amount of steam produced was twelve pounds per 100 square feet, equivalent to one brake horsepower per 183 square feet of sunshine. The maximum output for an hour’s run was fifty-five and one-half brake horsepower, about ten times the power production ever before obtained by a solar-generating plant, and equal to sixty-three horsepower per acre of land occupied by the plant. 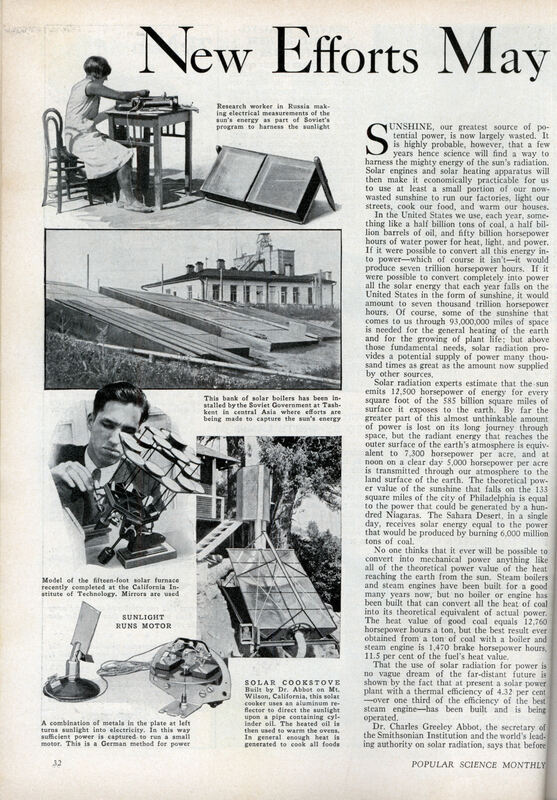 In 1916, while engaged in making solar-radiation observations at Mount Wilson, Dr. Abbot built a solar cooker that gives twenty-four-hour-a-day service. EXCEPT that concentrated sun rays, instead of a fire, are the source of heat, and that engine-cylinder oil instead of water is heated, this apparatus is much like an ordinary bathwater heater. The sun’s rays are reflected on a blackened copper heater tube, covered by two concentric glass tubes, by a cylindrical trough of light sheet steel lined with glossy sheet aluminum. This reflector, which is twelve and one-half feet long and seven and one-half feet wide, is mounted on a steel frame with its long dimension parallel to an axis pointing toward the North Star. An ingenious arrangement of counterweights, controlled by an inexpensive alarm clock, moves the reflector sufficiently for it to follow the daily march of the sun from east to west. On a platform about six feet above the reflector stands a twenty-by twenty-four-by thirty-six-inch steel reservoir, with two ovens, each nine by eleven by sixteen and one-half inches, in its back. 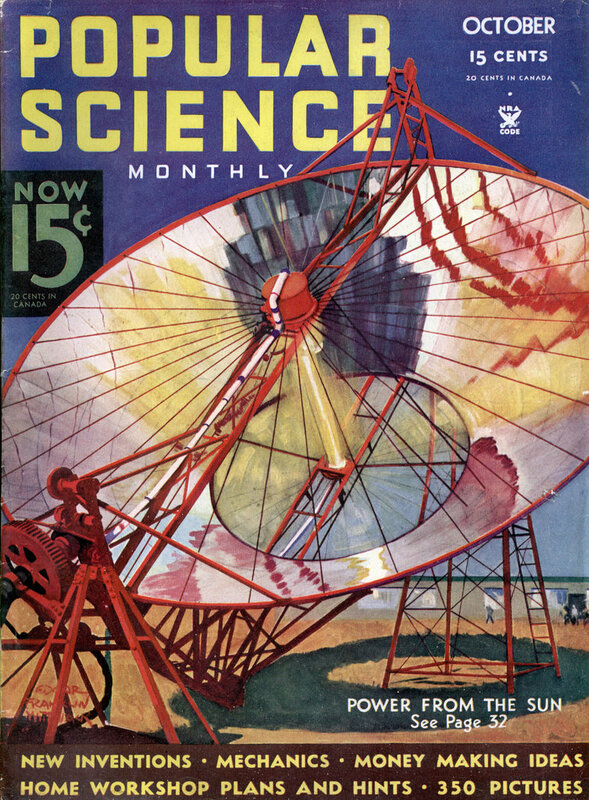 A copper pipe, one and one-half inches in diameter, passes down under the reflector, turns, and returns in the focus of the sun rays, as described. Although shaded by trees so that only about seven hours of sunlight a day are available, the temperature of the cooker’s ovens always remains above boiling, and many varieties of food may be cooked at night. At most times the ovens are hot enough to bake bread. A little known economics bar to solar is the banking industry. For decades if you wanted to install solar in a house, the banks wanted a significantly large backup system such as separate gas or electric water heater or they refused to loan money to build or buy. The duplication raised the cost of going solar which increases long term economic pay back. This put off potential buyers and home improvement applicants. It also made loans harder to qualify for by increasing the base amount above what solar adds which is significant. Between cheap energy and often bizarre bank loan restrictions on solar, [or any non-standard building design] the consumer demand was killed off. And on top of that, being contrary, the tax assessor would increase your property taxes for solar giving the payback another hit.